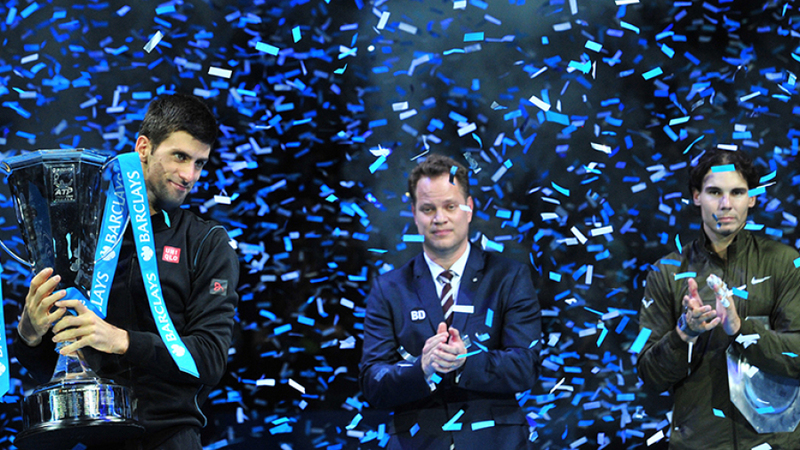 Novak Djokovic has successfully defended his ATP World Tour Finals crown after he denied Rafael Nadal a maiden triumph at the season finale in London. The Serb ends his campaign on a 22-match win streak, and has won the season-ending event for the third time in his career after getting the better of the year-end world No. 1 6-3 6-4. Unfortunately for Rafael Nadal, he saved his worst performance of the tournament for the final. The Spaniard appeared to be fatigued, and in the early exchanges of the match he seemed to be forcing the play, which is something he has not done all week, and not striking the ball was cleanly as he was in his run-up to the final. The machine that is Novak Djokovic on the other side of the net capitalised on this, and perhaps as a player who has already won this title in the past knew how to play against the man desperate to triumph, as in the crucial moments Djokovic was clinical to ruthlessly take advantage of a below-par Nadal. Fuelled by the defeat in the US Open final, Djokovic may not be the season-ending world No. 1, but his form since that loss has been worthy of that ranking, and he ensured he would crown his season off with a title defence as the main man, and the one in the ascendancy ahead of next season. Nadal was the last player to beat Djokovic when he toppled the Serb in the final of the US Open, but Djokovic has now won their previous two encounters, here at the O2 and in the Beijing final back in October. Nadal, appearing in his second final at the event, had taken out record six-time champion Roger Federer in the semi-finals in straight sets, but the wait for a first World Tour Finals trophy continues for the Spaniard. In the 39th meeting between the pair, with Nadal leading 22-16 before tonight, the Spaniard had won three of their five clashes in 2013, but in the final match of the season, it is Djokovic who lifts his fourth event in as many tournaments to end the year on a high. 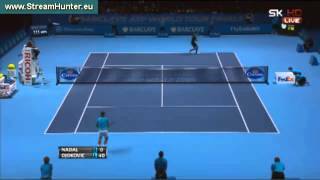 The defensive work of Djokovic enabled him to claim the first break of the match, and with Nadal coming out second-best in the rallies the Serb was able to take a 3-0 lead. However, after he prevented his opponent from getting a double break, Nadal found his rhythm to get his first game on the board, and it was the beginning of a fightback from the Spaniard as a forehand which went long from Djokovic saw Nadal reclaim the break. After he levelled at 3-3, Nadal showed his delight with a fist pump, but it was Djokovic who was to have the final say in the set, as he broke once again in the eighth game following an unbelievable rally where the pair were both drawn to the net, and then sealed the first set with an ace after getting to 30-30 thanks to a lucky bounce off the net cord. Nadal did not look himself on court, and the way he lost the opening set may have weighed heavily on his mind heading into the second, as at the third attempt Djokovic landed the break en route to a 3-1 advantage. Djokovic maintained the break at 4-2, and had two more opportunities for the cushion of a second, but Nadal stood firm to keep with Djokovic to take the seventh game. His opponent held serve to move within one game of victory, and saw one match point disappear as he closed the gap to one at 5-4. But after being forced to serve for the title, Djokovic kept his composure to finish his season in the best possible way to end Nadal's hopes on his third championship point. "I would like to start by congratulating Rafa and his team for an amazing season, what they have done this year is amazing and congratulations in ending the season as world No. 1," Djokovic said after receiving the trophy. "Thank you to all the fans here. Thank you for coming out here every day this week, there were no empty seats for any of the matches, thank you so much for supporting all of us." Nadal said: "It has been the most emotional season of my career. To play the last match of my season in this stadium is a big thing for me at the end of this season, against a player who was much better than me today. Thank you to everyone here and around the world who has supported me this year. So see you next year."